“Now, I’m sorry, but that just does not make sense!” J.B. Fletcher- multiple episodes. 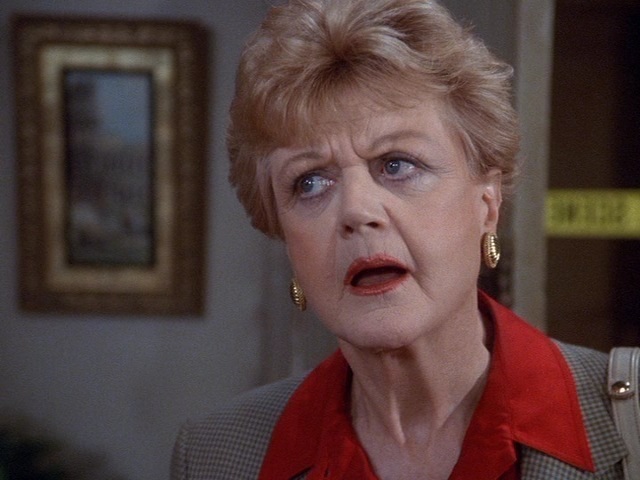 “Murder, She Wrote” is a simply phenomenal American television show about a little old lady played by Angela Lansbury–JB Fletcher–who is probably your grandma and who, confound it, just has people get murdered everywhere she goes. She’s also a mystery writer, which totally makes her super legit at figuring out who done it. The series ran from 1984-1996. It’s just that good. Aaron Hernandez was an NFL football star for the New England Patriots. Quickly rising to fame as one of the most dangerous Tight Ends (a skill position that blocks and catches passes designated as TE), he was given a 40$ million contract from the Patriots. Shortly thereafter, he was put on trial for the murder of Odin Lloyd. He was cut from the team before that–merely for having the charges brought against him. Jessica [JB] Fletcher flies in to Massachusetts to visit with some of her friends there who have partial ownership of a company that pays a lot of money to the Patriots. They’re cruising around the facility and they meet with some of the players, including Hernandez. Jessica is impressed by his kind attitude and queries him more about the sport, something she has little familiarity with. “What is it you do for the Patriots, Aaron?” she asks, leaning over the door of the convertible to get a better look at the man. “I’m a Tight End,” he replies, with a smile. “Oh my!” ejects JB, “That’s a bit forward of you! Are all NFL players so blunt?” She says it with a wink and a smile, but is clearly a bit befuddled. “I’m sorry,” says Aaron, grinning more broadly now, “it’s not a reference to my ‘assets,’–I am referring to a position on the field. I block for the quarterback and then run routes. I’ve caught a bunch of touchdowns, and will keep doing so in the future.” He ends with a wink at a pat on the shoulder for J.B., who is still seated in the top-down convertible. At the word “murder,” the camera zooms in on Hernandez’s face, showing it go dark for a moment. Fletcher, as always, takes note for later. After he waves, he hops in his own car, popping out his cell phone and appearing to have a rather angry conversation with someone. He sees Jessica watching and closes the door, rolling up its tinted window as a brief ominous cord of music sounds. “J.B., mind if we stop in? I’d like to speak with Aaron for a moment, given all the news stories flying around,” Kraft asks. “Of course!” Jessica follows Kraft into the weight room. “Aaron, you’ve met Jessica, right?” queries Kraft. “I understand,” says Jessica with a smile. Jessica’s eyes narrow, something is wrong with that statement, but she can’t quite put her finger on it. “That’s all I needed to hear, Aaron, have a nice day!” Kraft nods to Hernandez, lightly touches Jessica’s arm, and they walk out together. Later, the evidence seems strong enough that the police arrest Hernandez and the Patriots cut him from the team. At the murder trial, both Kraft and Jessica are called to the stand in turn. Jessica has got it figured out now. Based on the testimony of Kraft and Fletcher, and on top of a mound of physical and other evidence, Hernandez is convicted and sentenced to life in prison without parole. J.B. Fletcher and her friends are at a local restaurant, enjoying a plate of lobster. “Looks like you sealed the case, Jessica!” one–Bob–says. The episode ends with the whole group laughing, stopping on a shot of Jessica’s face lit up with a big smile. I couldn’t resist writing this blog. It just is too perfect. The Hernandez case was–in part [and alongside what sounds like mounds of physical and circumstantial evidence]–was sealed just like an episode of “Murder, She Wrote.” If you liked the show, it might be worth looking into the case more. If you like awesome television, check out the TV series–it is fantastic. Hope you’ll drop a comment to let me know what you think, and follow my blog for more fun content. The image in this post is not my property but I use it under fair use. So when do you think Teddy Bridgewater will end up starting for the Vikings? I’m not a betting man at all, but I do enjoy speculating about such things. I was talking about this with some coworkers and friends and based on those conversations the Over/Under would be 6 games into this season. I’m honestly thinking it would be right around Game 6, but Matt Cassel is, in my opinion, a competent starter so I would take the “Over” on this. With a new coach in place there is not an urgency to win immediately this year and make the playoffs. However, having AP means they do need to try to win now while he’s still around. So I think if Cassel does struggle much there will be a greater urgency to pushing Bridgewater in to start. However, I wouldn’t be terribly surprised if the Vikings just benched him all year to learn the tricks of the trade. What are your thoughts? When will Bridgewater start for the Vikings? Why will he start then? Just briefly, I thought I’d write out my thoughts on the first round of the NFL Draft that happened yesterday. Yes, I picked these winners because they were exciting. It’s always interesting to see QBs drafted and multiple picks in a round. That said, I do think these two teams had the best day. BROWNS: The browns were, in my opinion, the biggest winners of the day. They managed to fleece the Bills by moving back for not only their 9th overall selection, but also next year’s first rounder and fourth rounder. That’s a whole lot of team-building power. Then, they barely had to give up anything to take the 8th pick and take the guy they wanted anyway with a strong cornerback. Later, they used their accumulated mass of picks to trade up and nab Johnny Football, who, if nothing else, will sell tickets and bring a huge level of excitement to a fan base lacking it for some time. Seriously, even if Johnny Manziel doesn’t work out, they still have already set themselves up with an extra first-round pick next year. I suspect Manziel will be decent, but not great. For the sake of some friends who are Browns fans, I hope he’s amazing. It would be exciting to see his style work in the NFL, and to see the Browns take that division again! VIKINGS: The Vikings also did a nice job picking up an extra pick to swap places with the Browns, then nabbing a solid pass rusher. The best move they made, in my opinion, was to move back into the first round and take Bridgewater. Although I’m not completely sold on Bridgewater, I think that his alleged failure on a pro day and the like don’t show much. Numbers don’t lie and he’s had some awesome seasons. I expect him to end up as the starter for the Vikings by the end of the year. They’ve got a solid team and I think they could compete in the stacked NFC North. LIONS: Eric Ebron is an exciting pick with a big upside, but I really hated this pick for the Lions. They desperately need help on defense and they have solid options at tight end. I’ll say it: I’m not at all sold on Pettigrew because of his drops, so I would have liked the Ebron pick except that he’s also questioned for having a number of drops. There’s nothing like seeing a perfect spiral pass bounce in and out of a tight end’s hands to make a fan base upset. If Ebron had solid hands to go along with his height and speed, I’d say this is a good pick to take some pressure off of Megatron, but for now it just seems like yet another weapon that’s going to be inconsistent due to drops. We’ll see, but I think defense was a better option here, not to mention that Fauria could, I think, be developed into more of a threat. BILLS: Yes, they got Sammy Watkins who is a very exciting receiver, but they paid way too much for him. Two first rounders and a fourth round pick is an extremely steep price, but time will tell whether Watkins shows he deserved that kind of future-mortgaging. On the plus side, I do think this gives them a chance to see whether they can stick with EJ Manuel as their starter. He has been provided a ton of weapons now so now the Bills can see for sure what they have after a roller coaster rookie year from Manuel. TEXANS: Yes, they got the premier player of this draft, but I really think they should have done anything they could to trade down. Rumors continue to abound that they were asking for three first round picks in exchange for this one. If there were an Andrew Luck, that would make sense, but no team would seriously consider that even for a sure thing at defense. Because the Texans asked too much, they didn’t get the opportunity to stockpile picks and talent. I think they could have gotten two first round picks and maybe a third and fourth. That would help them to plug an awful lot of holes in their roster. It will be interesting to see how Clowney does across from JJ Watt, though. The QBs in their division should be sweating.